New Health Advisor - New Health Advisor for Daily Health Care. Home Digestive System Where Is Your Pancreas? How much do you know about your body? 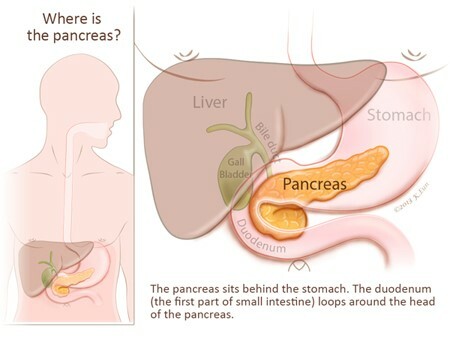 You know where your heart is or where your stomach is, but do you know the exact location of your pancreas? It is obvious to feel confused and ask, "Where is my pancreas?" because it is deep under your tummy. Keep reading to learn more about it. Precisely, it is located deep in your abdomen with part of it tucked between the spine and the stomach. The other part of your pancreas is in the curve of the first part of the small intestine, called the duodenum. If you touch your right pinkie finger and right thumb together while keeping other three fingers straight and place your hand in the center of your abdomen just below your lower ribs, your hand will be at the level of your pancreas. It is usually difficult to detect tumors of the pancreas mainly due to its deep location. It is for this reason that most people experience no symptoms of pancreatic cancer until the tumor grows in size. Now that you know, "Where is your pancreas?" you may want to learn a bit about the roles it plays in your body. First, your pancreas produces digestive juices. Secondly, it produces insulin and other hormones related to digestion. The exocrine pancreas is the part responsible for producing the digestive juices, whereas the endocrine pancreas is the part responsible for producing insulin and other hormones. As you eat food, your digestive system breaks it up and sends the partly digested food to the beginning of the duodenum in a couple of hours. The pancreas releases digestive juices when food reaches the duodenum. The juices mix with the food and help break it down. This leaves small fragments of food that your body absorbs through the small bowel. Insulin helps regulate levels of sugar in your blood, and is therefore very important for health. If the level of sugar is high in your body, your pancreas will secrete insulin to manage the imbalance. Similarly, your pancreas secretes less insulin when there is enough sugar in your blood. You develop diabetes when your body does not produce enough insulin. Acute pancreatitis: In this condition, the inflammation develops quickly but it is usually not serious and goes away completely. Chronic pancreatitis: In this condition, the inflammation is less intense but is persistent. It may lead to scarring and permanent damage to your liver. You develop acute and chronic pancreatitis due to same reasons. The most common cause is alcohol abuse and gallstones–about 35-45% of patients develop pancreatitis due to these causes. About 10-20% of pancreatitis is caused by trauma, medications, infections, chemical exposures, hereditary diseases, surgical procedures, and high fat levels in the blood. Your doctor may order different tests and follow specific procedures to diagnose pancreatitis. They may order blood tests to check for the levels of pancreatic enzymes; stool tests to check the levels of fat; and CT scans, abdominal ultrasound, and endoscopic ultrasound to make a correct diagnosis. MRIs also prove effective in identifying abnormalities in the pancreas, gallbladder, and ducts. Empty your stomach for a couple of days to help your pancreas recover. They give you clear liquids and bland foods after the inflammation is under control. Give you pain medications to help relieve pain. Give you intravenous fluids to provide your body with some energy, which helps repair your pancreas. They may recommend endoscopic retrograde cholangiopancreatography (ERCP) to open a blocked or narrowed bile duct that could be the cause of your pancreatitis. May recommend gallbladder surgery to remove gallstones. They suggest pancreas surgery in case they think it is necessary to drain fluid from your pancreas to prevent further damage. They may help you find a treatment program to end your alcohol addiction if excessive drinking is the underlying cause of your pancreatitis. In order to deal with your chronic pancreatitis, your doctor may try different treatment options. They may start with pain medications that block pain signals, recommend pancreatic enzyme supplements to help improve digestion, and help you understand what changes you need to make to your diet to improve your condition. So, once you know, "Where is your pancreas?" you will understand how important it is not to ignore any symptoms that may indicate an issue related to your pancreas, such as pancreatitis. Be sure to talk to your doctor when you suspect something wrong. Last Updated 24 April, 2019.